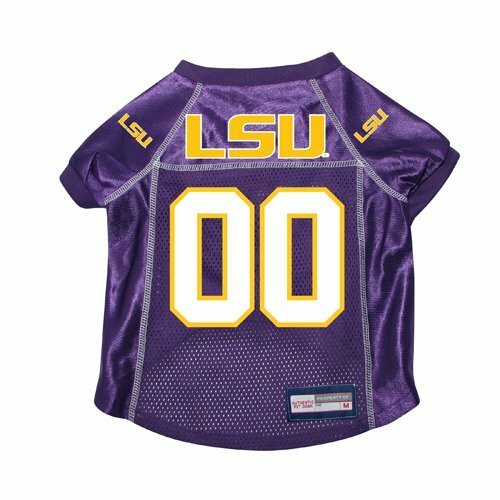 Louisiana State premium pet jersey - MEDIUM. This great-looking jersey features applied team logos on the sleeves, team name/number on the back along with a sewn "Property Of" size tag where you can write your pet's name on. The jersey has an updated look and feel - more like an actual player jersey - quality mesh, with satin-like accents on the shoulders/sleeves and down the sides! Cut shorter on the front belly area. Made of 100% polyester - hand wash. Approximate sizing(a size medium or large for example doesn't necessarily mean for a "medium" or "large" dog). Be sure to measure ALL AREAS of your pet to best avoid having to return. NECK - measure neck around. LENGTH - base of neck to base of tail. GIRTH - the chest at widest point, which is usually behind the front legs. Comfort levels may vary with each individual dog. Officially licensed Collegiate product. A great item for the fan and their pet. View More In Pet Jerseys.